Happy Friday afternoon friends. I am really getting into the Christmas mood now and I have even painted my nails for Christmas. In Christmas colours of course 😀. (Only not too sure how long this nail varnish will last though!?). Have you every tried Barry M before? 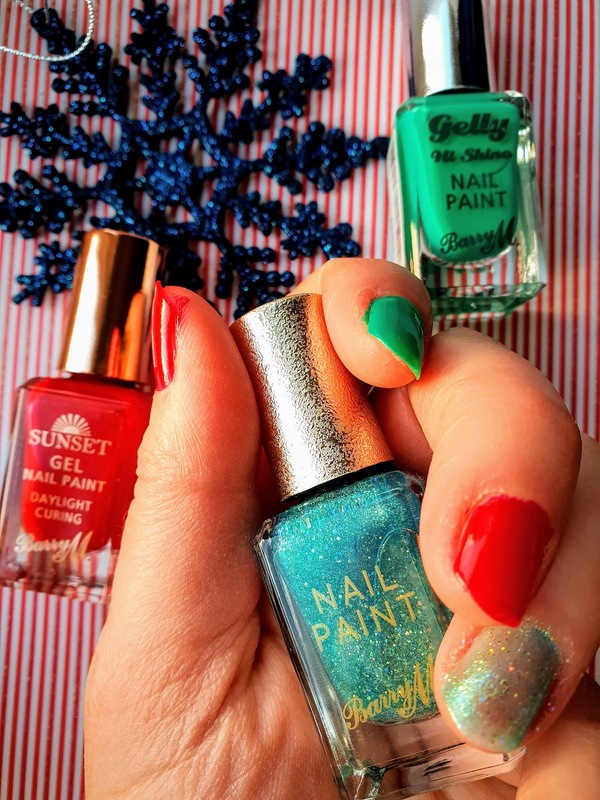 I love to see long, beautiful painted nails with amazing nail art but they are just not practical for me. I can not type on my computer properly with long nails. No way would I want to wash the dishes or do any housework in fear of breaking them. Also in my sleep, I pop my arm under my head and always scratch my neck when my nails are long. How pretty are these nail colours? My Daughter talked me into going inside the beauty outlet in McArthur Glen last week when we went shopping. I wanted some new nail varnish for Christmas off we went for a look. I had been looking for some high gloss nail polishes for a while now and when we went inside, we found some straight away. These Barry M nail varnishes were a bargain at 3 for £5.00 so I picked out 3 straight away. I wanted my nails to look like Chrismas so I think I picked out the perfect match. The plain green one is called Kiwi and looks lovely and glossy on. Lovely colour. The red one is called can't get you out of my red and is stunning. I always go for red and this is so glossy. 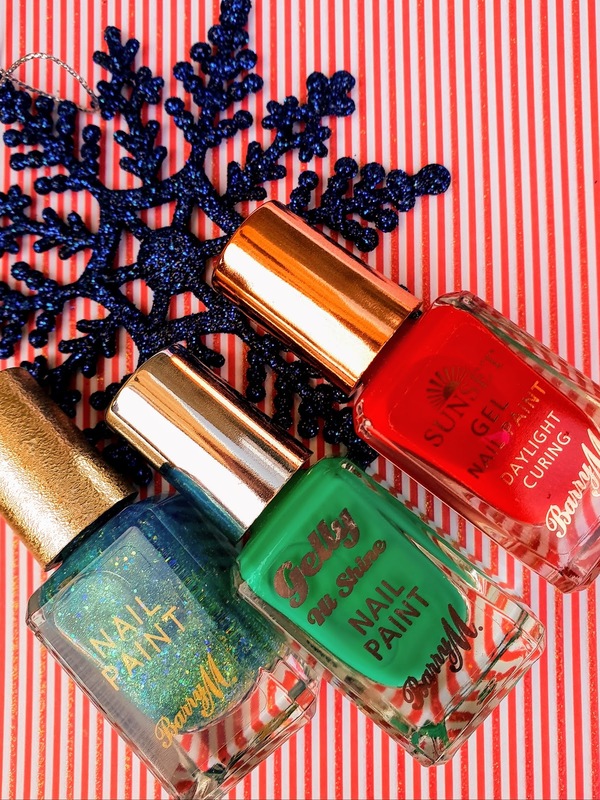 The greeny, bluey gold one is called catwalk queen and is beautiful too. I can not resist a bit of sparkle, especially around Christmas time. 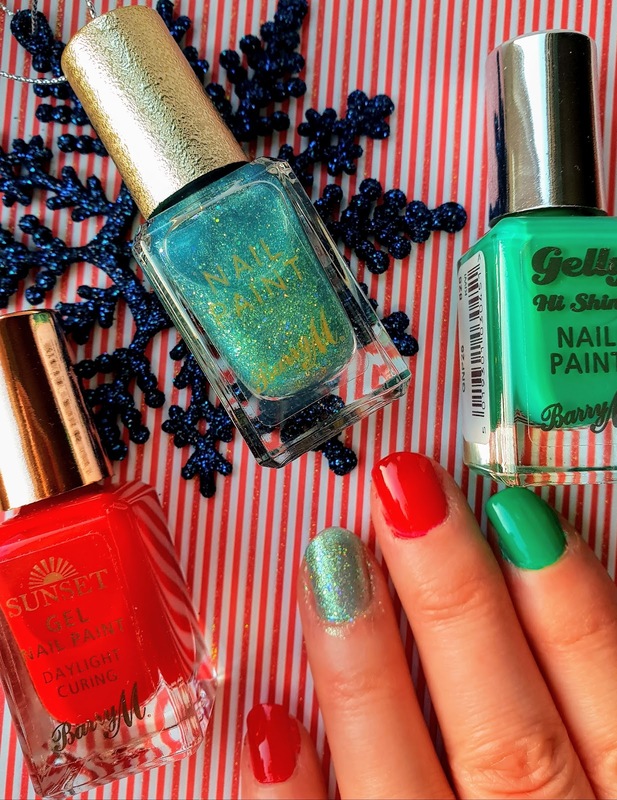 Christmas Holiday Nails with Barry M. Dressing My Nails Up Like A Christmas Tree!! I used to paint my nails red and green for Christmas but this year I decided to go with black. I love these nail polishes though. I'm nowhere near steady enough to do my own nails but the red is both festive and class! That was so cute! So i have to paint my nails that colors too. Christmas is so fun..! I love how festive all of the colors are! Especially the glitter one! I love the shades. You just reminded me to get my nails done.